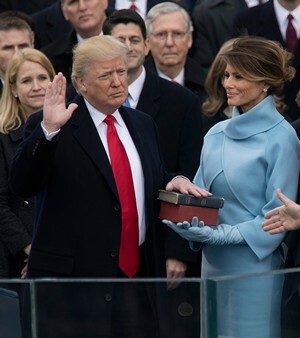 Against all reasonable odds, Donald Trump rose from a discounted Republican candidate to take the President’s oath of office. “How did this happen?” How is because Trump is the product of self-focused personal ambition and pushed himself forward at exactly the right time. The real puzzlement is why did it happen against all expectations and so quickly, too? Maybe Trump’s election is no big deal. After all, the sky has not yet fallen – conditions have not actually changed all that much. Nice idea – but… You cannot immediately identify what happened to our stability, nor even that a stability change occurred. You can see the event clearly, but only after the passage of time. The issue – we live in a chaotic world where present reality emerges when the tangle of uncountable things that could happen condenses into those that actually do. The 20th century lifestyle ended in 2016 Nov 08, not 2000 Jan 01. But the new 21st Century paradigm may well have begun 2017 Jan 20. (Fig 1). Trump happened because we were ripe for chaotic social change. First, a techno-break to discuss what we mean by chaotic orbits, and shifts in our social life patterns. Next section – the Donald Trump phenomena. You may skip to there, if you wish. Think of our social structure as a basically stable system with gentle shifts among its interconnected parts. For example, our states of inequality and economic opportunity were essentially stable in American (US) society from WW-II until a bit after 1981. One key feature of chaotic stability is the ‘pendulum swing’ effect. You can see it in the voting records. Voters first want (slightly) conservative leaders, then (slightly) liberal leaders; then again, then again. You could think of this as the occasional but almost regular oscillation about an average center. With more than one kind of political influence thread, you get a quasi-stable orbit (rather than an oscillation) about a conceptual center for our political stability. Visualize Chaotic Orbits Suppose there were only 3 activity threads that influence the state of society. Each of these would be independent of the others except for cause-and-effect interactions between the results from each thread. We visualize this as the concept graph in Fig 2. Each of the three influence threads is an axis direction (vector). Fig 2 NOW moves in a chaotic orbit about (+), the fixed point attractor. The blue swirling line is the path of the net effect due the ‘pendulum’ swings in each thread. This path through the concept graph is like a jet airplane’s contrail. Our current location (NOW) is the round yellow endpoint. Notice the fixed point ( + ) as the apparent center of the motion. These are LastTechAge names for markers recently identified by Yascha Mounk and Roberto Foa as The Signs of Deconsolidation of democracy in world politics. Foa and Mounk’s ideas have been discussed by, for example, Amanda Taub (New York Times), and Jonathan Rauch (Atlantic Monthly). Although Anxiety, Ethnicity and Inequality seem to be useful to trace Donald Trump’s rise, there are certainly many thousands of such threads that influence the direction of social change. For simple visualization, the choice of any three does not matter. In a world of 7 billion people, there may be thousands of millions of mutually interacting, independently swinging threads affecting social stability. If there is a forcing function at work on some of the the influences (dimensions), the “fixed point” ( + ) will move. Small pushing forces usually cause small drifts in a system’s fixed point, and Fig 1 does display a slight drift in its center as the NOW point moves in its orbit. A Chaos-Shift can happen if the push is strong enough If the pushing influences are too large, the direction of the motion of NOW (through concept space) may abruptly shift the “fixed-point” attractor ( + ) to an unpredictable location. Fig 3 shows a such a chaos-shift with our diagram. An observer must wait at least one full orbit to estimate the position the new ‘fixed’ attractor point. An unpredictable jump in the orbit’s fixed point is much more likely than a minor shift in its position if the active NOW value has drifted too far from its attractor, or if the forcing function is too large or too abrupt. But chaotic systems are not predictable (not causal) so a chaos-shift might just happen. Chaotic orbit effects happen for almost every system you can image, not just politics. For any system, plot each influence as in Fig 1; the system average will show some type of chaotic orbit. See James Gleick’s 1987 bestselling popular discussion Chaos; or Melanie Mitchell’s 2009 Complexity, A Guided Tour – one of the best popularized discussions of chaos and complexity theory. Well, not in our chaotic world where myriad probabilities converge to form reality. But the current state must orbit its quasi-fixed point at least once before its details can be identified. Overview of chaos-shifts Fig 2 – the contrail leading to the current NOW is the trace of several orbital loops about the attractor, its stable point. This path is what we have called the timeline. Fig 3 – Our conceptual stable point governing social interactions is a quasi equilibrium (sort-of equilibrium). Every society has such a point that normally drifts slowly about our concept diagram, but if many influences push too hard, the quasi-fixed point could shift suddenly. The USA has experienced 36 years of a steady push on the lowest earning, poorest educated segment of our population. We have called that push the Slow War (check out Piketty Discovers America). The Slow War is a covert revolution. It has been waged by people who despise the open and fluid state of traditional US government. It was well planned and carefully staged; each step generated an incremental shift from what had been previously true. This firm slow push over the decades has shifted wealth from lower income brackets and into the hands of the richest families in America. Over these same decades, hundred of millions to billions of US dollars were spent to mold the attitudes of the Common Man (see Dark Money ). This indoctrination thrust of the Slow War shifted the blame for the ever-increasing inequality onto the very people trying to stop it. The Slow War has been very successful. The Slow War did not cause the chaos shift by itself. Society is not a simple structure; it is a pulsating complex of separate interacting threads. Because of the complexity of the societal network, the root cause behind the Trump ascendancy is more complicated than just this single driver. But without the Slow War, Donald Trump could not have won. Destabilizing money. Subversive, revolutionary efforts since the mid 1960s had placed our social fabric in fragile equilibrium, but the huge funds put into Republican hands at the beginning of the 2016 Primary season must have been destabilizing to party unity. (About 1 billion US dollars was promised to the candidate who most impressed the ultra rich circle of donors.) This 2016 push was more determined than anything tried before. Destabilizing anger. The general American population feels a deep unfocused anger. Everyone understands something has gone wrong especially during the last generation. Talk Radio indoctrination may not have completed a total Manchurian Candidate brainwashing, but for the last 15 years each then-current government was blamed, first Bush. Then Obama. O was elected partly because he told everyone that the forces of social destruction could be overcome: “Yes, we can!” But: No, we didn’t. Obama’s initial focus was on preventing our sad rich families from suffering further. Life got worse for those earning at or below median wage (about $55,000). Destabilizing disregard. News reports quoted many people (median wage and below) who said they had voted for Obama twice but their own future was ignored … would have voted Sanders, did vote Trump. I met such people here in swing-state Michigan. While Obama tended to Wall Street, the equality ideologues pushed agendas that were unpleasant to mainstream citizens. Unpleasant, even nasty. Democrats ignored the clear and present warning signs. The root cause of Trump’s win was the ties by the leadership of both parties to the monied elite. Trump claimed his opponents were elitists. Unfortunately, he was right. LastTechAge reported on this burning anger in …yet the fire rages. Return on Investment Trump’s win was a massive change in our historic political history. 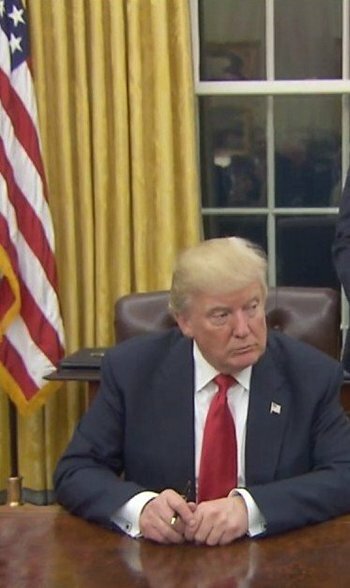 Was there a “great right wing conspiracy?” Jeremy Peters reported (NYT 2017 Mar 06) that the Americans For Prosperity (AFP) and FreedomWorks have announced that “they” have lost patience with Trump and plan to pressure Republicans to start implementing one of their massively damaging promises. This is payback for the decades investing personal wealth towards the destruction of our country. They won. Now it is time for their return on investment. 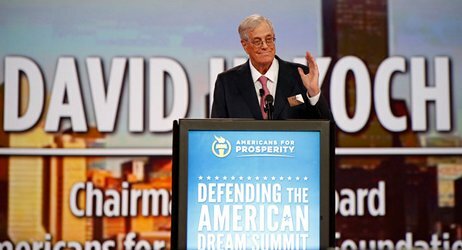 AFP and Freedomworks are the 2 major organizational fronts for the ultra wealthy Charles and David Koch (Fig 5). They are the visible leaders in the tangled and covert web of attack dogs that have been set up to steal the birthright from American blue collar workers. Patience pays off, stupid! Want to change the Future? The Koch brothers have taught us the way. 1. How To Succeed – use small incremental steps, Test the results with focus groups and make necessary adjustments in your approach. Let the results sink into society until adjacent trends start to bend on their own in your direction, then do more small steps. After 2 to 4 generations, a large mass of opinion in our population willl have been modified to your way. This assumes no one is doing the same incremental indoctrination but in opposition. 2. How To Fail – Hey! Your ideas are more than just. So force sudden abrupt change on a society that does not (mostly) see it your way – you should… and as soon as possible! Pass laws, require compliance, generate penalties for bad behavior. Right now! God is on your side. Yes! Method 1 moves the quasi stability point slowly. Method 2 moves the quasi stability point suddenly and can force a chaos shift to an unpredictable location. Because of the huge number of influence threads operating, no one can specify the full details of any current fixed point. This means you can never go back to where you were. You can never unbake the cake in chaotic situations. Appendix – Donald Trump, the Mule? Is this like Science Fiction’s famous chaos shift? Must comment on an observation that was all over the internet before and after the election. (Try googling: trump mule asimov.) 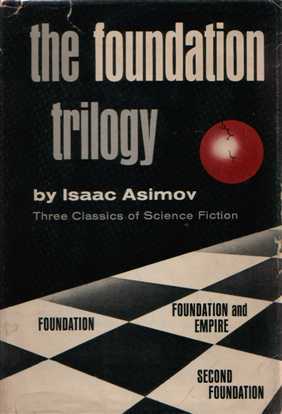 Isaac Asimov published his Foundation trilogy about 65 years ago (Fig 6). A long time from now, in a galaxy far, far away, economist Hari Sheldon devised a mathematical predictor of all societies to appear for thousands of years. It was run by the Foundation and succeeded for hundreds of years; it failed when a man, called only The Mule, emerged into the politics of the worlds. The Mule was totally outside Foundation analysis parameters and should not have existed, but did. He acted the clown, controlled his followers with psionic mind control; he conquered all. This was a chaos shift with a vengeance, sort of as we have just experienced. But Trump is not the Mule. The Mule was a spontaneous genetic mutant who mentally controlled everyone. Trump took over a society had been diligently prepared for takeover – but just not for him. Donald Trump is the result of inherited wealth; he is an egoist and he does not recognize anyone as a person such as himself. Trump schemes to control everyone, has bragged of lying in business deals, and is terribly afraid that someone will eliminate him from the world stage. See? Not the Mule … just the typical corporate C.E.O. This entry was posted in Politics, Pres Trump and tagged Amanda Taub, chaos shift, chaotic orbits, Charles Kock, David Koch, Donald Trump, Jonathan Rauch, Roberto Foa, slow war, Yascha Mounk. Bookmark the permalink.